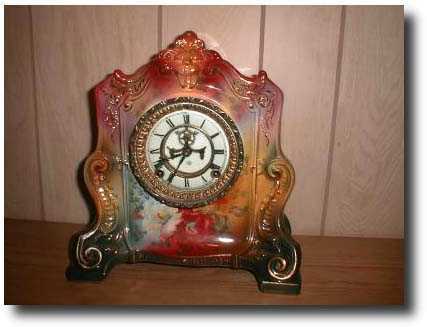 Ansonia Royal Bonn "La Cannes" Porcelain Mantel Clock, circa 1904 Porcelain case; brass movement, 12" tall by 11 1/2" wide; condition: excellent. This clock has been carefully inspected by a qualified clockmaker and adjusted to run perfectly. The only part that isn\'t original to the clock is the replacement tin can cover on the rear.